The setting is in Lebanon and Sameer is longingly looking forward to the return of his neighbours who have fled during the war. " The family who had lived there had gone away during the troubles, because they were different from most of the people in the village." He is hoping that he will find a friend his age to play with and spend time with. When the family returns a child is present, but it's not a boy as Sameer wished, but a girl....a very unfriendly girl. For years Sameer's family has been enjoying the bounty of the magnificent olive tree that bows down across a stone barrier fence between the neighbour's property and his. He would gather the rich, ripe olives for his mother and she would add lemon and salt, making them the most delicious olives in all the land. Muna, the little girl who moved in next door is not happy about him collecting "her olives" and accuses him of stealing them away from her family. You see the trunk of the tree is in her yard and only some branches of the tree spread over to Sameer dropping the olives on his side of the fence. One fateful night a huge storm arrives and lightning strikes the tree causing it to split and crash to the ground. The sheer magnitude of the crash crumbles the wall leaving an open gap between the neighbour's homes. Stunned at the devastation, Sameer decides to be a good Samartian and help Muna and her family clear the ruination. Muna with a grateful heart offers the olive branch of peace and leaves Sameer a gift to show he is a proven friend indeed. When Lebanon was wracked by war, some families stayed and some fled. Sameer’s family kept an eye on the house next door, and enjoyed the fruit dropped by the olive tree between their properties. Muna’s family fled. But now they’re home.While Sameer longs for a new playmate to climb the tree with him, Muna’s more concerned to keep things safe and right, and hang on to what’s hers. And the olive tree, that could unite them, has grown on her side of the fence.Author Elsa Marston never explains why Muna’s family fled, or why they might seem unfriendly on their return. What readers see is what a child will see, illustrated with haunting simplicity by Claire Ewart, and described with smoothly lyrical writing and voice. When Sameer is told he can’t enjoy the olives anymore, he lets them rot on the ground, and nothing more is said, no argument... until the storm.Two families, separated by an olive tree, are united in the end by surprising kindness when nature takes a hand. Meanwhile readers gain a glimpse into a different culture, a smile from a different world, and a wonderful story of sharing, forgiveness and hope to offer to children everywhere.Disclosure: I received a free copy from the publisher and I offer my honest review. It’s a beautiful book! The Olive Tree by Elsa Marston, illustrated by Claire Ewart, offers young readers a peek into the richness and complexity of the Middle East through a simple tale of division and conflict that culminates into a hopeful story of friendship and unity. A classic symbol of peace and prosperity, this olive tree is planted next to a wall dividing two families. The tree itself is rooted in the property of one, while the fruits of the tree fall freely on the other side of the wall onto the property of the other. The main character, Sameer, has remained in his home despite the troubles of war, waiting for his neighbors to return and hoping that the family would have a boy his age. Instead, they return with a daughter, Muna, who wants nothing to do with Sameer and even accuses him of stealing their olives when he collects those that fall upon his family’s property. When a storm destroys the old olive tree, the two discover the benefits of forgiveness, sharing and cooperation and plant a new olive tree for their families to share. Ewart’s watercolor paintings capture the earthy tones of the lush Lebanese countryside as well as the tempestuous storm that destroys the divide and clears the way for a new beginning. From the expressive eyes of Sameer and Muna to their endearingly animated goat and donkey, the illustrations add depth and impact to Marston’s strongly crafted text. Extend an olive branch in a gesture of peace...Wisdom Tales Press brings us another quality children's book. I have read many of their books in the past and have been impressed with the high calibre of their offerings.THE OLIVE TREE is a wonderful story by author Elsa Marston and illustrated beautifully by Claire Ewart.The story is for children ages 5 years old and up but even younger children might appreciate the messages of overcoming prejudices, and showing sharing and compassion to each other.Sameer and Muna are neighbors that start out fighting but, after a fierce storm hits their area, end up with a broken wall between their homes (bringing down the physical barrier between the families) and also the storm knocks over the old olive tree the children had been fighting over. The children literally offer olive branches in gestures of peace to each other.This is a lovely story with a strong message for peace.NOTE: I received a copy of this book in exchange for my honest review. Set in Lebanon, this story has lovely illustrations and teaches a lesson about being friendly and helpful. When Sameer's neighbors return to their home after being gone for many years due to "troubles" in the country, he hopes that they will have a son who he can be friends with. Instead, they have an unfriendly daughter who tells him that the wonderful olives that fall off of the tree that grows in her yard, but overhangs into his yard belong to her family only. Then, lightening strikes the tree and though the adults walk away sadly, the children finally find a way to share and become friends. I received this book free to review from Netgalley and I highly recommend it. This story is beautifully and simply told. It tugs at the heart-strings and encourages all of us to do better, be generous, and work together. Along with Elsa Marston poignant story are exquisite illustrations by Claire Ewart which bring the story to life and gives us a glimpse into the beautiful country of Lebanon.I highly recommend the The Olive Tree. It’s one that will grace our coffee table for years to come. Beautifully illustrated story of forgiveness and learning to live side by side. Sameer and Muna are neighbors in Lebanon brought together by misfortune. The touching conclusion could provide a great springboard in the classroom for discussing ways to resolve differences. The story was a bit meh, but I loved the setting and the illustrations. Muna and her family fled their home in Lebanon during the war. While they were gone, Sameer, the neighbor boy, took care of their precious olive tree that had been in Muna's family for a hundred years. While gathering olives, Sameer would dream about the family that lived next door. He would imagine them returning and having a son that he could play with. One day, Sameer looked out and the family had returned. His excitement turned to sadness when he found the family had a daughter, not a son, and she was not interested in playing or being nice. As Sameer picked up the olives that the tree had dropped into his yard, he meets the neighbor girl who has no interest in sharing the olives off of HER tree. Sameer is disappointed and angry until one evening, everything changes.This is a sweet story of friendship, forgiveness and sharing. I like that it is set in a different culture, which makes the story more unique and gives us something else to learn about and discuss with your child.The illustrations are beautiful and look like water colors. I love how the illustrator added animals into the photos even though they have nothing to do with the story. Each photo is filled with details to keep your child interested in the pictures as much as the story. This is an excellent picture book to share with your child. The lesson it shares can apply to all of us. An amazing culturally responsive interactive read aloud. From the moment you open the cover you will be drawn in by the stunning illustrations. The Olive Tree is a story about two Lebanese children and how they find friendship through the destruction of an olive tree. This book is perfect for the classroom:•	Problem/solution and how they are connected. Both the problem and solution are easy for young readers to understand.•	Lesson/moral – friendship•	Symbolism – olive tree, brick wall, transferring of wood to neighbor’s yard, olives in the basket, headscarves, etc.•	Predicting with evidence to support thinking•	Using context clues for new vocabulary•	Retelling – this book is written with distinct events that makes teaching retelling easy for emergent readers•	Types of print (bold/italics) Why does the author do that?Elsa Marston eloquently captures the understanding of friendship but she also sparks my interest to learn and understand more. The Olive Tree is a beautiful multi-cultural book that should be shared with all school age children. 5 beautiful stars. The Olive Tree by Elsa Marston and beautifully illustrated by Claire Ewart is a heart-warming tale of sharing and bonding over an olive tree between Muna and Sameer's homes. The story was reminiscent of the tale of King Solomon's wisdom where two mother's claimed an infant child belonged to them. King Solomon suggested splitting the child in two so that each could have half knowing the true mother would likely give up her child rather than see the baby die. The story of The Olive Tree is not quite the same yet similar enough to draw the correlation. It is definitely worth the read and a great lesson in sharing the good and the troubles of life. I also really enjoyed the setting and the current time period in which the story takes place. So many children's books are written for what seems to be an era that has passed, and it is good to know that such good lessons can be brought into the present day and the world as it is for our children to read now. This beautifully illustrated tale is set in post-war torn Lebanon as families start to return to their homes. Sameer has lived next door to the empty house for years and his family have harvested fruit from the old olive tree that overhangs both gardens but now the family are returning. He hopes they will have a son with whom he can play but they don’t - they have a daughter instead. This book tells about when Muna and her family return to her family home, which they had left because of the war and how Muna doesn’t want to share the olives with Sameer and his family. How can the families be brought together? The book gently explores how through forgiveness reconciliation can occur. I actually thought the story delightful but wanted to know more about what happened next, it seemed cut short - I wanted more!Thanks to the author, publishers and NetGalley too for letting me read this book in exchange for this, an honest review. The first thing I noticed were the illustrations – they are beautiful!I am a big fan of Wisdom Tales books because they tend to be short reads that have good lessons for kids to learn.The Olive Tree was no exception.The book is easy to read and provides a story of sharing for the kids.The blurb above gives a good overview of what the story is – it is very straight to the point and is definitely something I am sure adults can definitely relate too, but it is written from the view of a child – for children.It is a great lesson for the kids and I know that my kids certainly enjoy it! 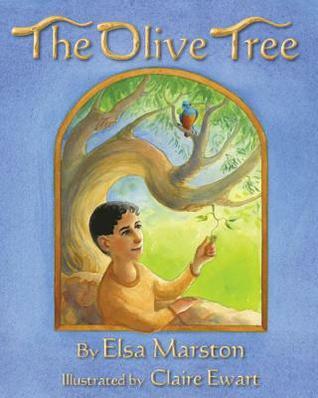 The Olive Tree by Elsa Marston tells the story of an olive tree that divides families. It stands in the yard of a family in the Middle East who has fled during the war, but its olives fall into the yard of the neighbor next door. When the olive tree owners return, the neighbors are disappointed to learn that the owners angrily declare that collecting the olives is stealing. The olives lay on the ground. The owners and the neighbors are estranged. Then lightning hits the tree and destroys it, and the families are somehow reconciled. Beautiful story. This book had wonderful water color illustrations! I love how the book was based upon the tree and the children in the story. The tree was a blessing to both families in the end of the story. A good book about peace and learning to get along despite differences. I won this book on Goodreads.com. This is a great children's book that teachs child how to be nice to one another and how to share what they have. I thoroughly enjoyed reading this book. The pictures are great as well!! This was a nice book about sharing and values. When a little girl moves in and doesn't allow the neighbor to have the olives that fall into his yard, one major change brings the two together to realize what is really important. I thought this was a good story for a young reader. A beloved olive tree teaches two Middle Eastern children how to make peace in this nicely illustrated, poignant story about reconciliation.